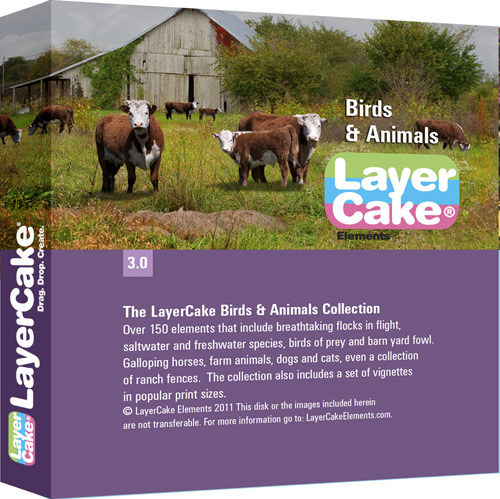 There are more than 150, professionally masked and cutout elements which include breathtaking flocks of birds in flight; saltwater and freshwater species; birds of prey; barnyard fowl; galloping horses; farm animals; dogs; cats; and , even a collection of ranch fences. Each of the masked elements resides on a layered PSD, or TIFF, sheet and is ready for a simple ‘drag & drop’ operation into the artwork you are creating. Easily add a group of floating gulls to an ocean scene; or, a grazing horse to your landscape. As an added bonus, LayerCake Elements has included a set of vignettes, in popular print sizes, to complete the eye-catching and subject enhancing look you want in order to finish your artwork. ● NOTE: Action sets are for Photoshop ONLY. Actions will not work with other editing programs. LayerCake elements' Flowers & Plants Collection is our original collection of professionally photographed, and masked, collection of more than 200 brilliant flowers; flower groupings; vines & ivy; interior and exterior shrubs; potted plants; planters; succulents; and, a colorful collection of butterflies. These elements add spots of color and greenery to barren backgrounds and dead spots in your photos. Each of these masked flowers and plants - and more - reside on layered, 300ppi, PSD or TIFF sheets ready for you to simply 'drag & drop' them into your artwork.The collection also includes a set of drag and drop vignettes in 14 popular print sizes.